1. Where are your scenes painted? Most of the scenes are in Sonoma County, about an hour and a half north of San Francisco. Some are in Marin County, a few are in Napa County and a few are in San Francisco. If it is too hot inland, I often head toward the coast. I try to travel a bit to Southern California as well, specifically Manhattan Beach/Venice and Palm Springs, and when possible, the north Lake Tahoe area mountains. 2. How do you choose your subjects? First off, I think about the seasons and what is in bloom--is the mustard in bloom, are the vineyards turning color, is the lavender in bloom, are the apple or cherry trees blossoming, are the hills green or gold? Of course, there are always non-peak subjects to be found, but when things are blooming you want to take care of them. 3. How do you find your painting spots? I've been fortunate to cultivate some relationships with farmers, ranchers and vineyard owners, which allows me to paint on private property. Other times, I'll just start driving around, looking for color and contrast of values, and of course composition. When I see the right spot, it always hits me right away. 4. Do you paint exclusively "on location"? 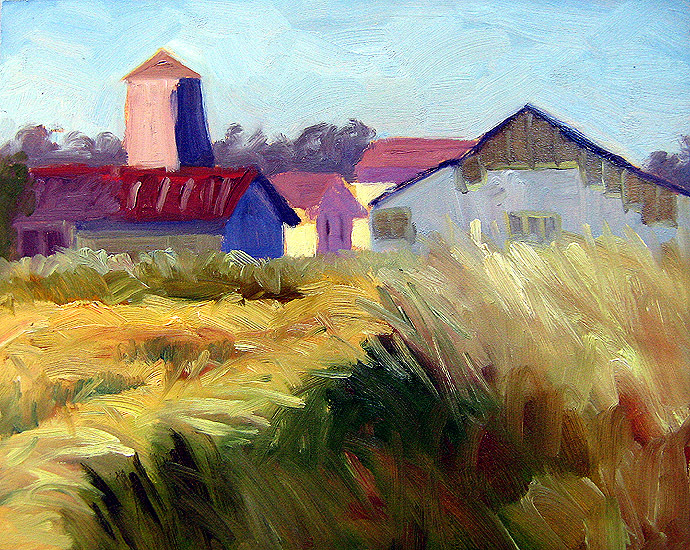 I paint on location ("in plein air") 95% of the time. Very occasionally, I'll paint in my studio, either from a photograph or to re-work a painting that didn't work out. 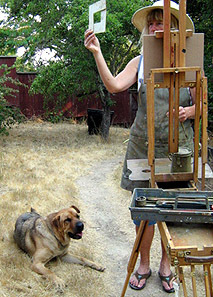 The viewer may not necessarily see a big difference between "plein air" and studio work, but as the artist, I always do. You can't work as intuitively in the studio, and outdoors you are under constant pressure, painting "from the hip". You have to battle the quickly changing light, the wind, the heat and the bugs, but I think this pressure gives an immediacy to the work that I can't duplicate in the studio. 5. How often do you paint? I'm a full-time artist, so I paint 5-6 days a week, weather permitting. 6. At what time of day do you paint these scenes? I try to start early and complete most of the work before mid-day. The light is more dramatic early in the day. As it gets toward afternoon, the light lasts longer, but it is flatter. 7. How long does a "little painting" take you? About an hour and a half. If I go longer than that, I think it loses some freshness. By comparison, my larger paintings usually require three sessions at the spot and then some tweaking in my studio. 8. What is your typical palette? I try to limit my palette, but that never seems to work entirely. My basic is the three primary colors (a "warm" and a "cool" of each), and then I add my favorite extra colors sometimes. 9. What is your art background? I got a BA in art from UC Berkeley and then an MFA at Columbia University, where my focus was large (5 ft x 6 ft) abstracts. I spent a few years as a textile designer in New York, at one point working for the "supermodel" Cheryl Tiegs, who had her own line (not one of my highlights!). 10. Would you recommend an aspiring artist major in art in college? Not necessarily. I'd recommend taking a couple of core classes--figure drawing, drawing and composition, and a couple of painting classes. You don't need the full degree, though of course it never hurts. Although the programs at Berkeley and Columbia weren't as technically-based as I needed, I was fortunate to study at Berkeley under Elmer Bischoff and Joan Brown, two prominent members of the "Bay Area Figurative School", which included Richard Diebenkorn, David Park and Nathan Oliveira. Bischoff and Brown were mentors to me and influence me to this day. Sadly, the only member of this group of five still alive is Oliveira. 12. What was textile design like? The design world in New York was fast-paced and cut-throat. On one level, I was semi-successful-- one of the "Good Morning America" hosts liked to wear my designs, and now and then others would appear in the windows of 5th Avenue department stores. But artistically, textile design was not rewarding at all. What I took from it was the ability to mix colors, to work fast, and a "tight hand" (which is good and bad). Only one. I was displaying large-scale abstract paintings in New York and the famous east coast landscape painter Wolf Kahn came to my opening. He commented favorably on my work. I didn't think much of it at the time, but when we moved to Sonoma County, I got some books on Wolf Kahn and began "plein air" painting. 14. How did you get the idea for LittlePaintings.com? From my husband. We were on vacation and I was sketching, and he said, "Hey, you should paint quick 8 x10s and sell them for $100 each!" I thought he was crazy and resisted the idea for six months, mainly because I was too proud to sell an original painting for $100. I finally tried a few little paintings, sort of liked the way they flowed, and people started responding to them. 15. What is special about Sonoma County? You have all this beauty and variety right out the door. From world-class wine country to redwood and oak groves, to apple orchards, to river valleys, to pastures, mountains, and a spectacular rocky coastline. It never occurred to me to be a landscape painter in other places I've lived. 16. Do the paintings need to be framed? No, the 8 x 10 hardboard panels are engineered to hang on the wall right away, flush, using a simple screw or nail. You can of course frame them if you like, but there is no need to. The panels are custom made for me with this in mind. 17. Do you have a favorite type of scene to paint? I do love to stack up clusters of barns when I come upon them, though of course structures are more difficult than pure landscape. 18. Do you enjoy painting the 8 x 10s as much as your traditional larger works? On one level I do--I enjoy the quickness and freshness of the little paintings. I'll always struggle a bit with the 8 x 10 dimensions, but I suppose that's part of the artistic challenge! 19. What are your personal favorites of your little paintings? "The Bay at China Camp"
"Frederick's Lane Blossoms, April, #2"
20. What do you like most about doing the little paintings? The interaction with others around the country who connect with my work. There's no greater reward than that!